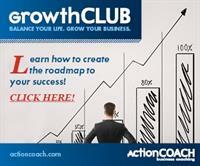 Join ActionCoach Siouxland on June 27 for our GrowthCLUB workshop. GrowthCLUB is a once a quarter workshop that assists you and your team on strategies that will help you in mastering your time, be clear on priorities and equip you with the mindset and tools you need to achieve your goals. Take action today! Balance your life. Grow your business.